Who and what are Shadow People.? Reports of shadow people have existed throughout history. The observer generally reports seeing a dark shadow that resembles the form of a human which appears and moves of its own accord. The figures does not have distinguishable facial features and may be either much smaller or larger than a human. They are often noticed as movement from the corner of the eye, sometimes disappearing when the observer turns to investigate. Shadow people may move quickly across a room, usually disappearing through the wall or closed door. Many report a feeling of extreme dread or fear accompanying the sighting. Others have reported that when the shadow moves across their physical being a feeling of extreme cold overcomes their body. This sensation of coldness disappears once the apparition is gone. Many believe that shadow people are the ghost of someone who has passed on but is not able to leave this physical world for some reason. Others believe that shadow people are creatures of another dimension that somehow overlaps our own, causing it to be partially visible. Many have captured images of what they believe to be shadow people in photographs. Other paranormal enthusiast believe that shadow people were never human at all and are a demonic spirit that embodies pure evil. Some have reported seeing glowing red eyes, but generally shadow people appear as a simple form that resembles the human form. Some report the presence of a hat or cape. One thing in common is that shadow people often try to avoid detection and like to observe from corners of the room, usually at night. Shadow people have been observed in daylight and many have observed them in full vision, although it is common to catch a sighting from the corner of the eye. A state, known as hypnogogia, a physiological condition when a person is half way between sleeping and waking, could explain some sightings. During hypnogogia, the individual can be aware of the environment and at the same time be in a dream like state where they can receive images from the subconscious that they perceive to be real. In this waking-sleep state, similar to sleep paralysis, the individual often reports the sensation of dread that may be accompanied by shadows or flickering lights or other visual hallucinations. Hypnogogia could explain many instances of people reporting shadow people, but it does not explain the appearances observed by those who are wide awake or day time sightings. Other skeptics attribute shadow people to nothing more than overactive imaginations and neurological disorders that trigger hallucinations or visual disturbances. This may be true in some cases, but does not explain images caught on film or shadow people who have been observed by more than one person. Shadow people do not appear to be dangerous, although they fill the observer will an overwhelming sense of fear and dread. The sense of pure evil may create a foreboding and uncomfortable atmosphere in the home. Many choose to seek the help of ghost hunters, psychics, and even the clergy. It may be helpful to invite paranormal investigators to your home to identify the haunting. For some, a psychic cleansing has taken care of the problem. Others have chosen to invite members of the clergy to perform an exorcism of the home. Still others choose to simply leave the shadow people alone and cohabitate in relative peace. More information on Shadow People. The strange and disturbing phenomena of encountering a “shadow person” is one that cannot be confined to one area or time. These dark figures have been reported throughout history. People, regardless of their cultural or societal origins, make the same descriptions. The dark shadowy shapes have always generated a feeling of dread or terror in those who have seen them. It is because the same thing is seen, regardless of a person’s background, that it is likely that they are a real event. 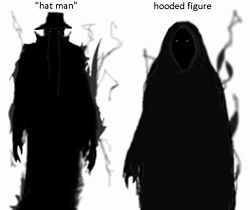 The shadow people, as they are called, refers to the humanoid forms seen often on the edge of vision or upon waking in the hypnagogic state from a deeper sleep. Often the manlike figure is standing near the bed or in a corner. Even though the figure is solidly black with no discernable details within the darkness, people generally have a firm belief they are being watched. Even when awake, these shadow forms can appear. Sometimes the encounter begins with an out of place blob of shadow that slowly takes on the silhouette form of a person. Sometimes the form appears hooded and cloaked. Sometimes it looks as though it is wearing a small-brimmed, Fedora style hat. While the shadow people are most often seen indoors, they have also been reported in wooded areas and on city streets. They are frequently witnessed in areas and places that have the notoriety of being “haunted.” The shadow people are not known to directly attack and often vanish upon being spotted. The fear they create in victims of a visit mirrors the effects described in tales of the “nightmare hag” syndrome, leaving the victim paralyzed and fearful. Despite their seemingly two dimensional appearance, some of them seem to witnesses to take on a more solid three dimensional form. With the increased popularity in ghost hunting there has been an increase in the ability and incidence of capturing images and thermal readings of these shadow people. This is enough to show that there is something there and not just hallucinations. While previous theories of the nature and origin of the shadow people have included malevolent ghosts, demons, psychic energy manifestations and misinterpreted patterns of light and shade, a new and more frightening hypothesis has been gaining popularity with researchers. There is increasing connection of the shadow people to extraterrestrial activity. It is thought that the shadow people are in fact a form of energy manifestation through which people are being remotely observed by some outside source. It is not know whether this observation takes the form of an astral manifestation or a cross-dimensional interface between the frequencies that separate the dimensions. The shadow people are seemingly insubstantial and fleeting in their appearances which make investigation difficult. Quite often they vanishas soon as they are spotted. If they are really the “eyes” of an alien intelligence it makes the issue much more critical. There has never been an incident reported in which the experiencer fell anything less that fright and dis-ease in the presence of these shadowy forms. check out these videos on shadow People. Shadow person caught by Dorset ghost Investigators.